This picture belongs to the late period of Rembrandt (1655 g). A few years ago, famous art critics, led by Julius Held, were challenged by the painting. It was hypothesized that the canvas was written by Rembrandt’s best student – Willem Drost. 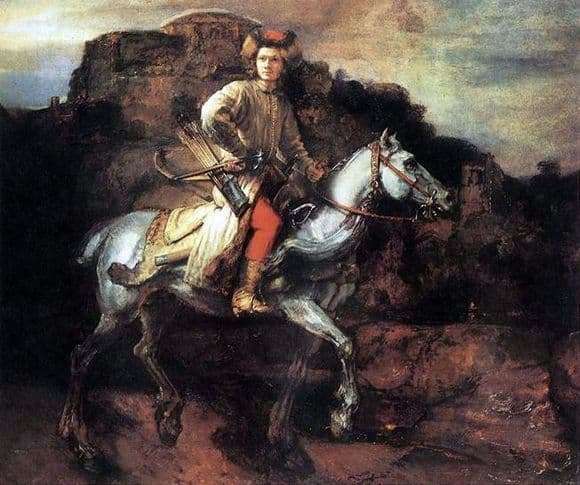 Despite numerous disputes, the painting “Polish Horseman” is included in the list of the best works owned by Rembrandt Harmens van Rijn. The painting received world recognition after its finding in 1897 by a connoisseur of painting Abraham Bredius in the Polish town of Dzikuv. The canvas has a medium size (115 × 135 cm) and is written in oil. The painting depicts a courageous young man riding a horse. The character is captured in motion looking thoughtfully into the distance. The style of clothing indicates his belonging to the seventeenth century Polish cavalry. Long belted kaftan, red fur hat, leather boots. The rider is armed with a saber and a dagger, in his right hand he holds a bow, a quiver of arrows is attached to his belt. It is truly unknown who posed for the painter when writing a picture. It is possible that it was a simple Pole, not a trooper. The artist paid special attention to the second most significant character of the painting. The warhorse is depicted stately and graceful. Thick white mane, majestic gait, purposeful look, wide nostrils. The rider with his faithful friend is perceived by the viewer as a whole, striving for the same goal. The landscape of the canvas is rather gloomy and dull. Rocky terrain and a large dilapidated building, made in dark colors. Heavy clouds looming menacingly over the city. The terrain created by the artist creates a sad mood of the painting and only the “Polish rider” enlivens the landscape with his presence.